You remember the old Lighthouse Restaurant, don’t you? Or did you drive by during the times when the food was not very good and the service slow and wish the restaurant would return to its former glory? Well, fret no more. New owner Jamie Griffin has brought The Lighthouse back and has come out swinging in the big, bad, and unpredictable world of Florida seafood restaurants. 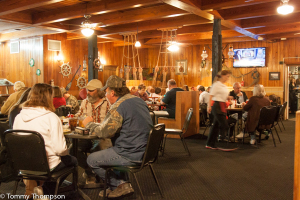 What helps this recent success is that Jamie’s no newcomer to the restaurant business, owning the Seabreeze in Cedar Key and Bett’s Big T in Chiefland (more about these two places in later posts!) and that he’s made an effort to return the Lighthouse to “Sue’s Old Menu” in terms of offerings, quality and especially prices. Expect a crowd at the Lighthouse–and maybe even a short wait for a table, especially on a weekend night. Or order your dinner to take out! The menu at The Lighthouse is extensive, and is based mostly on seafood offerings. However there are special things that will be of interest to landlubbers. 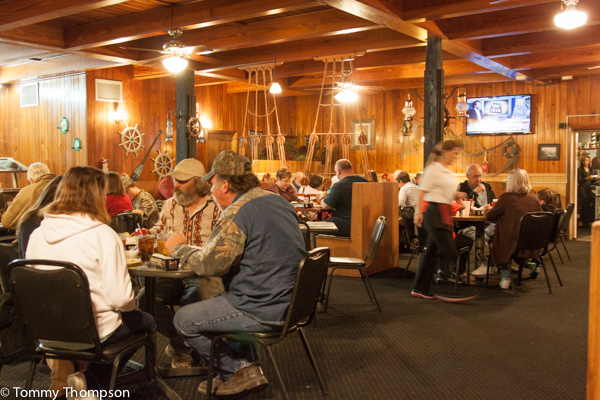 You’ll find the usual shrimp, oysters, mullet, crabs and other Gulf seafood specialties on the menu, but you’ll also find steaks, pork chops, chicken, burgers –even quail and frog legs! And for the veggie types, there’s a vast soup and salad bar. In fact, the soup and salad bar is included with every entree. Word has spread about the “new” Lighthouse Restaurant. On a recent Saturday night, the place was packed with locals and travelers at about 7PM, yet the tables were turned efficiently and the food was delivered in short order. Capt. Rick Davidson and I were impressed with the speed of service and the friendly staff. Once seated, server Natasha brought us tea (beer and wine are available) and soon returned with our order. We were in a “fried food” frame of mind. 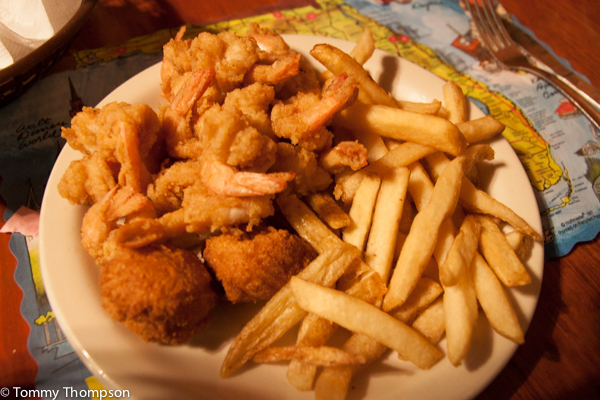 I ordered the all-you-can-eat fried shrimp plate (Only $15.50, including salad bar and excellent fries!) 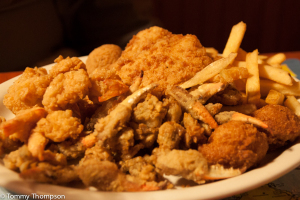 and Rick ordered the $20.50 fried Fisherman’s Platter (shrimp, scallops, crab claws, fish, and oysters). The food came quickly, piping hot and not at all greasy. Everything was delicious, and we even found some Jello and pudding on the salad bar for dessert! Fried shrimp at The Lighthouse can’t be beat! yes if I may comment: we are snowbirds and was so glad when Jamie reopened the place.the food the atmosphere is all great again,we will be looking forward to returning in oct and head for this great place again.thanks Jamie.